Not everyone will agree, but I think there is a compelling argument to be made that audio is the most important aspect of creating an immersive home theater experience. Yes, video matters, a lot, but what really draws you into the experience? Better contrast, or when you can hear the shell casings hit the ground behind you to the right? Which raises the obvious question around why more households opt to have a large HDTV and a soundbar than a real muti-speaker audio system? There probably are many reasons, but if I had to speculate [lack of] installation convenience for a wired system would be pretty near the top. Getting a traditional wired audio video receiver (AVR) up-and-running with five speakers and a subwoofer can be very complicated; after all, if you do not already have wires in the wall that will need to get sorted, which can be costly, time consuming, and certainly involves a lot more planning than slapping a “good enough” soundbar under the TV. Wireless audio provides another approach to getting around the installation complexity problem, but until recently wireless audio was either proprietary, substandard, or both. Which is exactly why we have been covering WiSA over the past few years as it evolved from ether to product. The axiim Q Wireless Home Theater System is the first holistic example of an AVR + 5.1 (or 7.1) speaker setup using the 5GHz wireless audio technology available for purchase. It is still in BETA however, with an introductory price of $1,500 for the 5.1 ($3,143 post BETA), and $2,000 for the 7.1 ($3,741 post BETA) systems, placing it currently on the higher end of the home theater in a box (HTIB) pricing scale. But, if it can deliver the same result as a wired system, without the hassle of wires then that is certainly worth a “convenience fee”, and with the Q’s streamlined user experience, including HDMI CEC, it could end up a bargain compared to a standard HTIB. Because it is an unfinished product, this should not be viewed as a comprehensive review; that will come later. Instead, let’s have a first look at the system. The axiim Q Wireless Home Theater System currently ships in 5.1 and 7.1 configurations; with only a difference in the number of XM.4111SS surrounds that are included with the Q AVR. Ease of use is a major selling point of the system, and that is obvious throughout the unboxing experience with clear and simple instructions included with each discrete component. Initially, I was a bit put off that there is not a distinction between a “main” and “surround” speaker, they are the same. From a traditional point of view ideally you want a bigger, throatier speaker with additional cabinet space and more drivers upfront. As a system targeted at convenience buyers, it follows a common HTIB trend of only having two speaker types, center and surround, to reduce cost and installation complexity. I do hope that in the future axiim expands speaker selection a bit though, it would be nice to be able to add a couple of tower, or larger bookshelf speakers across the front for larger rooms or just to add a bit more “punch” to the audio experience. Although, if you cannot wait any WiSA compatible speaker should work; with models from Klipsch and Bang & Olufsen available. 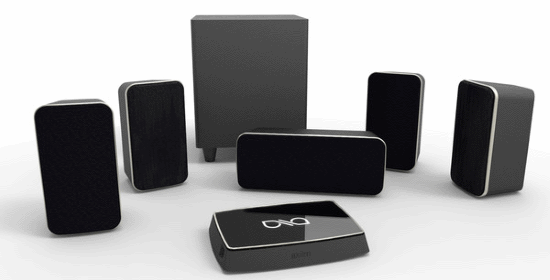 The Q Wireless Home Theater System includes the necessary power adapter, HDMI cable, and a Bluetooth remote. I have to admit that I am not a fan of the remote. Button feel is not great, lacks feedback, and I would have liked it to have more of them; providing greater coverage for what is possible with HDMI CEC. It needs to be said that the axiim Q Wireless Home Theater System is not really wireless. Both the AVR and each of the speakers require electricity to work, so you must find a socket to plug each component into. Audio delivery is wireless though, and that is where the moniker comes in. Most homes have at least one receptacle on each wall, which is significantly more convenient than pulling speaker wire through the wall or across the fireplace, risk your landlord’s anger, or worry about drywall to get a fully functional 5.1 setup. The Q.9100AVR is the least wireless component in the mix because, alongside power, it also accepts wired input from your A/V components, Gigabit Ethernet, and eSATA/USB storage devices. The AVR is digital only, so you will need to leverage one of the six HDMI ports for input. Along with storage, USB will also support wireless keyboards (via HID). Which is great for navigation if you do not fancy the remote. IR is also an option if you can find an RC6 compatible 3.5” receiver, unfortunately RC6 USB (aka Windows Media Center receivers) are not currently supported. Along with wired network support, the Q AVR also includes dual-band 2×2 802.11AC hardware, so you are well covered whichever mechanism is selected. Currently external storage is only useful for the built-in music player, but as the Q.9100AVR appears to be powered by some sort of Intel SoC, likely to be a Berryville Atom variant (hopefully one with PQE), it is not a huge stretch to see potential for other features in a future release. And if axiim open the platform up a bit, perhaps enterprising 3rd parties could even add apps like Kodi to the mix. It should be noted that there are no physical buttons on the Q.9100AVR, and aside from a blue light that fires up when power is applied, and then turns off when startup is complete, there is no physical indication that the device is on, or off. Some will appreciate the clean design of this approach, but I want both physical buttons to at least control power and volume, and some kind of state indicator. It does not necessarily need to be as verbose as most AVR displays, listing current format, processing mode, bling for HBR audio, etc., but something, anything, would be nice. Because audio is delivered wirelessly, the amps are included in the speaker cabinet along with the drivers. Removing the amps from the AVR dramatically reduces its footprint. Which means that it is miniscule compared to a traditional AVR (even the relatively small ONKYO TX-NR525), so much easier to find space for. Including directly under the TV. The axiim XM.101SW subwoofer is the standout speaker of the bunch. It looks great. Sounds great. Filling the room easily with enough bass to get you in trouble with its 10” down firing driver. Also, because it is wireless it is much easier to find the right place with less compromise. Oh, and you can add three more to the mix (the Q is 7.4 capable) if you need a bit more thump, or really want to meet the neighbors. It is possible to buy one à la carte, but currently you need to contacted axiim directly to make arrangements. Four axiim XM.4111SS are included in the 5.1 kit, each sporting a 1” tweeter and a 4” mid-range “woofer”. The exterior is mostly soft plastic that feels like a high-end non-metal mobile phone, with the drivers hidden behind a magnetically attached grill. There is a soft rubber shoe on the bottom doing double duty, supporting the speaker vertically and providing a housing where the 118” long non-polarized IEC320 C7 power cord is inserted. The surrounds do not provide a standardized mechanism for mounting, so if you need a stand or want to hang the speaker on the wall it is necessary to purchase the required accessories from axiim directly. The axiim XM.4211CS center channel is essentially a surround with an extra 4” driver, laid horizontally. Same basic construction, power cord, shoe, etc. Internally it is a bit different as it has an additional channel (three v. two) on the Class D amplifier housed within. If counting the ten I spent running down two power strips; once out of the boxes, getting started only took about fifteen minutes. Place components, plug them in, done. Odd as it sounds, routing HDMI cables through the A/V cabinet took longer than it did to get the axiim Q Wireless Home Theater System physically in place. Although, just like a traditional AVR it is necessary to run through some basic setup before the system will work correctly. In this case, it is a bit more involved because the Q AVR has to detect, pair, and assign each of the speakers. Where a wired system just needs to detect, or have you configure via a manual process, what speakers are attached; generally done through its room correction mechanism. The Q’s process is straight forward and simple. It counts the speakers, then asks you to tell it where they are in the room by playing a tone and blinking a blue LED on the speaker (although, it can be easy to miss if the grills are on), one at a time. In this case, I had Ethernet connected so it did not prompt to connect to the wireless network, otherwise that step would have included. Currently it does not include a firmware check/update as part of the process, but in the current firmware there is an obvious, indicated path that leads users to it. Hopefully this will be completely automated before the Q exits BETA. Compared to most AVR the axiim Q Wireless Home Theater System’s configuration screens are modern, descriptive, and relatively intuitive (not sure “MCE Remote” will be known by the broader public :)). While the geek in me screams for more knobs to toggle and dials to twist, I think the axiim Q does a good job at presenting enough options, without overwhelming their intended demographic with unnecessary clutter. Most importantly, for almost every option there is a description for what it is, and what it does. Automated room correction does appear to be missing though, and at this price point I think it needs to be included. 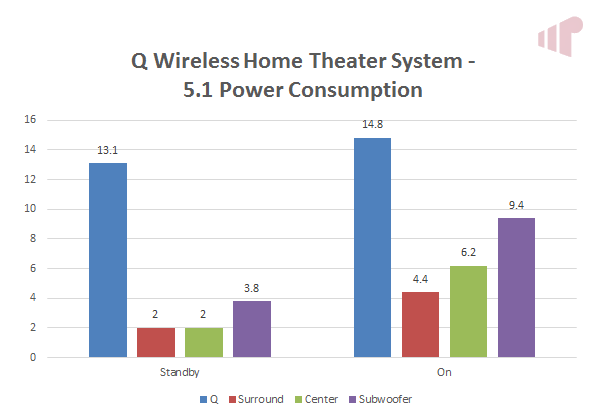 Using the Q Wireless Home Theater System is equally simple and intuitive. HDMI CEC devices are automatically detected, and most of them will set the correct logo without user intervention as well. Non HDMI CEC devices icons will need to be handled manually, but a few button presses gets that done as well. This goes a long way in making it easy for users, who are not power users, to make the system work. I know that HDMI 2 is the Roku and 3 is the PS4, but no one else in my family does – and frankly they should not have to. The Q’s design makes that much easier to accomplish without using an activity based universal remote. One aspect of this does bother me though. As it stands, non-CEC devices that are off do not show up in the input list. Where I think they should, at least if an icon has been defined. I think in the long run, this behavior will cause more confusion than the opposite, although I do see where the UI designers are coming from on this point where it can also be confusing to select a non-CEC input, and have nothing happen. In a future release, axiim intends to address this by indicating in some way (i.e. greying the icon, or making it slightly transparent) that a device is connected, but not available. I think this is a suitable compromise and look forward to seeing it implemented. This issue can be completely avoided by opting for devices that support HDMI CEC, and this is where the user experience really shines. The axiim Q.9100AVR is the first system where CEC actually works without the niggles that generally make it a six-of-one/half-a-dozen-of-another sort of thing. Most of this comes down to a strong commitment from the axiim design team to make it work. Iron out the vendor idiosyncrasies, and deliver the magic that HDMI CEC has promised from the beginning, but withheld like a petulant child. It was this approach that lead to axiim implementing a split CEC bus between the TV and the components connected directly to the Q.9100AVR. This allows them a much greater ability to isolate “problem” devices on either side. Brokering what is necessary, suppressing what is unwanted. There is one side effect of this choice however. If you are accustomed to using the TV’s CEC menu to manage device selection, that will not work for devices connected to the Q as it does not reflect those devices’ messages back to the display. The Q.9100AVR also supports Bluetooth devices, including HID (keyboard) and media audio. Unfortunately, aptX is not currently supported, but as that would be handled in software on the Q, hopefully it will be added later. No modern AVR would be complete without a mobile app, and there are versions available for both iOS and Android. Sorry Windows Phone, er… Windows Mobile, users you are left out, but seriously if you are still using WM at this point your expectations have to be nonexistent ;). The axiim app is very polished and works wonderfully. Finding the Q on my network, and driving things effortlessly. So much so, that I really only have one complaint – where is the “Stop” button? Oh, it would also be nice if the app would report status on power state, current configuration, format, etc. ; all the things I usually see displayed on the front of an AVR. There is a really cool feature where you can use the mobile device as an audio endpoint for whatever is currently playing through the Q; just press the headphone icon to toggle. Lastly a look at power consumption. I do need to point out that these numbers were produced with a speaker firmware (yes, the speakers have their own firmware!) that is still undergoing testing. So current systems will see numbers that are quite a bit higher for “Standby”, but roughly the same for “On”. I know that axiim is targeting lower numbers overall with an eye on selling into the European market, which has quite strict requirements for standby power consumption (0.5W). There is a significant amount of work to be done, especially for the Q.9100AVR to meet that target, but like everything else I have seen significant progress here as well. I am sold on the value of wireless audio, and the ability of WiSA to deliver the quality of a wired solution wirelessly. As I worked through my notes on the axiim Q Wireless Home Theater System, it quickly became apparent how few of them were related to wireless; which should be read as a good thing. Besides the initial “Wow, that didn’t take long”, the nature of the system stopped being notable any more than copper wires would be in any other audio system review; it just worked. While I will grumble a bit about the lack of room correction, a squishy remote, and the lack of physical feedback. The system sounds good. The fundamentals for a solid, non-proprietary home audio solution that delivers the level of quality that I expect is clearly present. The Q.9100AVR’s software is BETA. It has BETA oddities, but there has been a clear and marked improvement in quality and features in the short time I have spent with the system. If it continues at this pace, I am confident that it will be a fantastic option for those who cannot, or do not want to, run wires for a traditional home theater audio solution. There are a few elephants in the room. The first is that the Q.9100AVR is not 4K/HDMI 2.X ready. This may or may not be a concern depending on your long term plans for the system. There are workarounds, like attaching the 4K device directly to the [4K] display, and Smart TV apps will not be affected because in both cases ARC can push audio back to the AVR over HDMI. But, if the device is an Ultra HD Blu-ray player you will lose HBR audio capabilities because ARC is functionally equivalent to S/PDIF, and therefore limited to stereo PCM or lossy compressed formats like Dolby Digital (+), and DTS. Second, while I do think the $1,500 BETA pricing is reasonable for the 5.1 system, I am not convinced that the math works for 7.1 (reverse price $500 for two surrounds). Hopefully that, and the $3,143 -$3,741 eventual SRP is rethought at some point. And finally, why does the π symbol display briefly in the time section periodically? What does it mean? Thanks to axiim for providing the review sample. Thanks for the detailed first look and feedback provided–invaluable.